We’ve developed a plan for Canterbury that provides opportunities for new homes, jobs and shops with improved pedestrian and cycle links. Have your say. Canterbury was announced as a Planned Precinct by the NSW Government as part of a housing affordability package on 1 June 2017. Planning for these Precincts is coordinated by state and local governments, helping ensure infrastructure such as schools, parks, community facilities, public transport and road upgrades is delivered to support community needs. A reinvigorated town centre within the Canterbury Station Precinct that supports the South District of Metropolitan Sydney. Establish a new retail strip along Robert and Jeffrey Street extending from Canterbury station. New open space areas and community facilities that will support the growing population, in particular along the Cooks River foreshore. Protect and establish a built form that respects existing and potential heritage items. Enhance connections between Canterbury Town Centre and Cooks River. A proposed new park along the rail line could provide a new and interesting place for leisure and recreation. 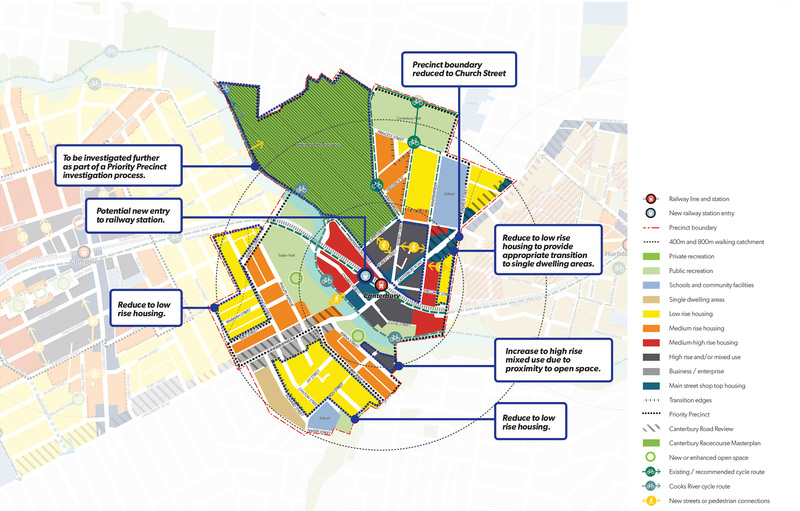 This map shows the key changes that have been made to the Canterbury Station Precinct Plan as a result of your feedback. Design of the GreenWay South West The Department of Planning and Environment (DP&E) is preparing a concept landscape master plan for a shared pedestrian and cycle link and linear park should surplus rail land become available. Public Domain and Station Access Plan Sydney Metro will prepare a Public Domain and Station Access Plan for improved station design, accessibility and interchange with other modes of transport. The new metro station at Canterbury will provide improved pedestrian and bicycle access. Priority Precinct Rezoning Canterbury Station Precinct has been identified as a Priority Precinct. DP&E will work with Council to prepare a master plan to support rezoning of the area including Canterbury Racecourse. Heritage Conservation Canterbury Bankstown Council will progress a planning proposal to protect newly identified heritage items across the Canterbury Station Precinct. We will use community feedback to produce the final Strategy. Once finalised, we will continue to work with stakeholders to deliver the Strategy and plans over the coming years including master planning and rezoning of Canterbury. Heritage needs to be conserved particularly in blocks bounded by Church Street, Canterbury Road, Floss Street, Melford Street and Canberra Street. Industrial and underutilised land along Canterbury Road is preferred for increased development. Canterbury Racecourse should be considered for potential residential development and public open space. Priority bus corridors and other measures to improve public transport needs to be planned for along Canterbury Road. Canterbury town centre needs to be revitalised with a new civic hub, including improvements to the streetscape and existing public open space. More community facilities such as child care and schools are needed to service the increased population. More detailed information on your feedback can be found in the Canterbury Station Precinct Plan.